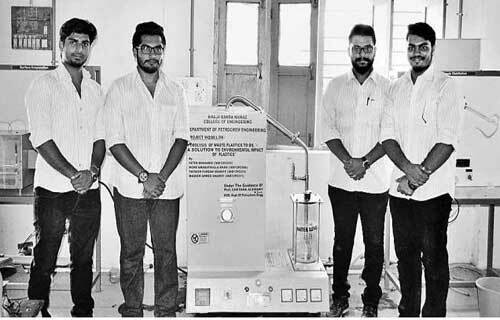 Four final semester students of the petrochemicals department of KBN Engineering College, Kalaburagi city, have made a remarkable breakthrough in converting waste plastics into oil that is widely used in industrial production, including electricity generators and diesel pumps. The innovative methodology adopted by them for the apparatus that is used in converting the plastics – including polypropylene, polyethylene, and polystyrene – has been successfully configured and tested by Fateh Mohammad, Mohammad Amanathulla Khan, Tafseer Furqan Sharieff, and Waseem Ahmed Shariff and they now propose to patent the product. The students, under the guidance of the Head of the Department Chetana Alimany of the college, used the principal of ‘pyrolysis’, a process that breaks down complex products in plastics to simple products like gas and oil. The students spent more than two months to configure the machine that has a capacity of 12 kg. The oil produced has diesel-grade calorific value. With further processing, the oil can be used as an automotive fuel and can be converted it into a second generation transport fuel, which requires a further purification process. Mr Mohammad said that the oil in its present form can be directly used in power plants for the generation of electricity, heat and stream. It can also be used in heating oil-fired burners, furnaces and turbines, hot water generators, hot air generators, thermal fluid heaters and electricity generators, by mixing the oil with 50 per cent diesel, in diesel pumps by mixing it with 50 per cent of diesel and can be used as substitute to industrial diesel. Mr. Mohammad said that this process would be an effective solution to overcome the environmental problems caused by the indiscriminate use and unscientific discarding of plastic. At present, only around 9605 tonnes of total plastic waste is collected and recycled and another 6,137 tonnes of plastic waste remains uncollected. Mr Mohammad said that the four of them had taken it as a challenge to configure the machine from a scratch after conducting in-depth research.